For 2019, we expect an even greater labour shortage across Canada – especially in remote and/or resort-focused regions. This combined with the customer service challenges of the usual high summer rush leaves employers like yourself short staffed in your busiest season. Plus, we’ll continue to face TFW challenges that will keep hindering that specific option for seasonal workers. Are you ready for a summer that’s set to have the most challenging labour market to date? Tourism and hospitality operations across the country will be competing for the same small pool of available labour – and as hires are made, that pool will shrink every day. But it’s not all gloom and doom – succeeding in the face of change is about being prepared. Watch our on-demand webinar to learn how, with advanced prepping, we can help you meet your staffing challenges head on. 4. HIRING CANADIANS VS. TFWS – is it actually a choice for your business? With continuing TFW limitations and the low unemployment rate in Canada, how will your business attract workers? 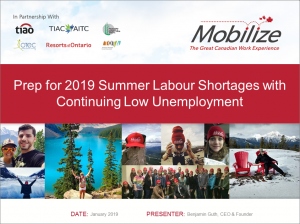 Our webinar will show you how to RECRUIT and EMPLOY Canadian seasonal workers, and RETAIN summer staff in this tighter-than-ever, labour-strapped, competitive market. 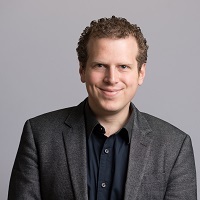 Mobilize Jobs CEO and founder, Benjamin Guth, will provide insights, tips and tricks we’ve learned from recruiting and deploying close to 1,200 young workers to date. We’ve placed workers at over 65 properties across Canada since 2014 and within America across two 2018 seasons.